After trying out more than 10 different WordPress themes, I have concluded that Thesis is the best wordpress theme. This article will show you why. I’m sure most of you know what WordPress is: you probably wouldn’t have checked this out page if you didn’t. But just in case you don’t know, WordPress in open source website creation tool that is written in PHP and MySQL. It is online and it is an open source project. Simply put, it is online software that allows you to create and manage your own website or blog. WordPress theme frameworks are used as parent themes or templates where all of the functions reside. Developers can create child themes to add different styling and graphics to customize how the theme will look while still keeping the functionality that is found in the framework. So, we are going to be taking a look at what is awesome and what might not be so awesome about one of the most popular theme frameworks available: Thesis. So here’s our Thesis Review. Thesis is a website creator that allows you to drag and drop content easily to design your webpage. Thesis allows you to modify four areas; Skins, Site Options, CSS, and Elements. Search-Engine Optimized- Thesis themes are search engine optimized. This means that the webpage is designed to display your content (that is already search engine optimized) in a way that appeals to both Google — since they are the ones who rank websites — and visitors. Those who visit the website will find that thesis themes are very user friendly. Layout generator- Thesis has an easy to use layout generator that allows you to pick column layouts quickly and easily. In Thesis, you can easily change the look of your website to fit your individual needs and tastes. You can easily change the colors, the fonts that are used, and the titles and order of menus that are used for navigating the website. You can easily customize your webpage’s multimedia box to include things such as videos and photos. You also have the option to change the amount of space that it occupies on the web page among other options. Hooks are one of the greatest things about Thesis. Hook allow you to add your own custom settings without messing around with the base theme files. There is a huge selection of skins that you can choose from that will allow you to choose one that fits your personality best. There are three plans that you can avail of if you’re going to use the Thesis Framework. Basic is priced at $87 and allows you to use the Classic Responsive theme, along with support for the next 12 months. With the Thesis Basic Plus plan at $164, you get access to all the Thesis skins, with Mailchimp & Aweber sign-up boxes. The Thesis Professional plan is priced at $197 and provides you with the ability to use the framework on an unlimited number of domains, together with lifetime support and updates, in addition to everything else mentioned in the two previous plans. Thesis can be quite pricey, but if you pay for the Professional plan, you get all of the benefits of Thesis for life. Check out their pricing page to find out more. With Thesis, there isn’t a huge selection of readily available themes like there is for other frameworks. There are a few ready-made themes that are available, but if you want to stand out from everybody else who’s using Thesis, you’re going to have to do some customization. That just goes to show that Thesis was designed for customization. Beyond the available skins, you’re going to have to dive into an ocean of code to find your own pearl of great price. The main disadvantage that can be seen in Thesis is the need for you to know some basic coding to unlock it’s full customization potential. Though some will consider this a disadvantage, it really depends on who you are talking to. Talk to a small business owner who knows nothing about coding and chances are he/she is not going to be keen on using Thesis. But talk to a guy who has even basic code knowledge, and we’re off to the races. The point is, Thesis was created for a particular group of people. 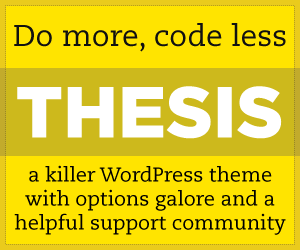 If you have some knowledge writing code, then you Thesis will allow you to create killer websites with ease and comfort. We certainly hope this Thesis review helped you find out what you need to know. Check out some of their videos here.